One of the first things I learned from using ithlete was that my HRV trend reflected my progressive adaptation to exercise. After my first conditioning session in two years I saw an immense drop in my HRV. Each session thereafter resulted in smaller fluctuations in my HRV score until eventually my trend was virtually unchanged from it. 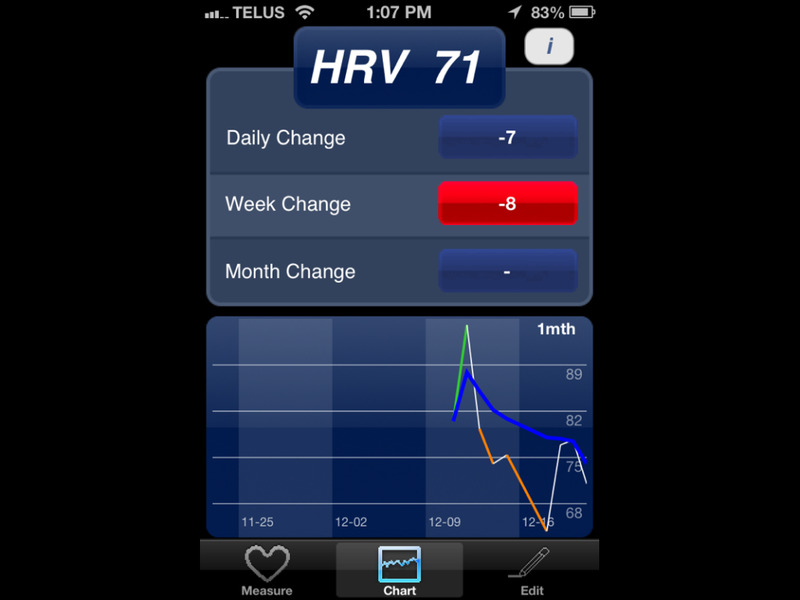 In the screenshot below you can see that in early October of 2012, I experienced a huge drop in HRV with a red indication. That was the morning after my first conditioning session (stair intervals). These workouts were performed each Wednesday thereafter with a progressive increase in sets and duration however you’ll see that HRV isn’t nearly as effected as it initially was. 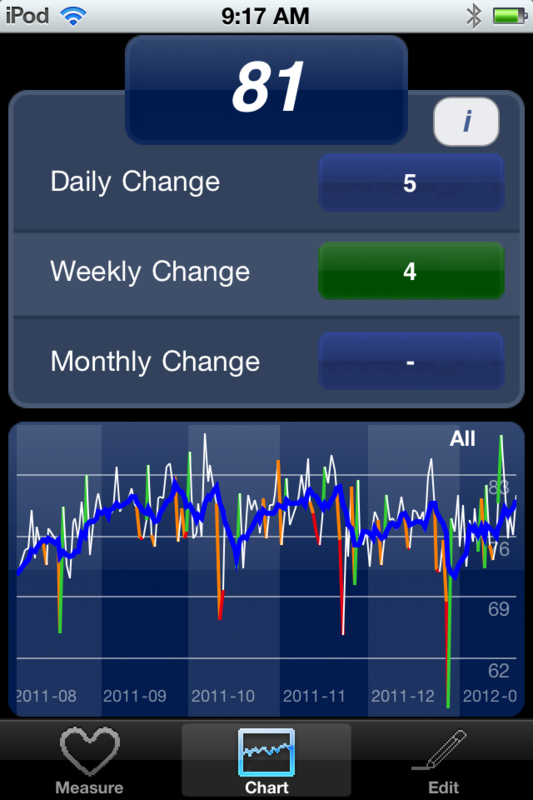 The next major drop in my HRV occurred in late November but wasn’t the result of a conditioning session. 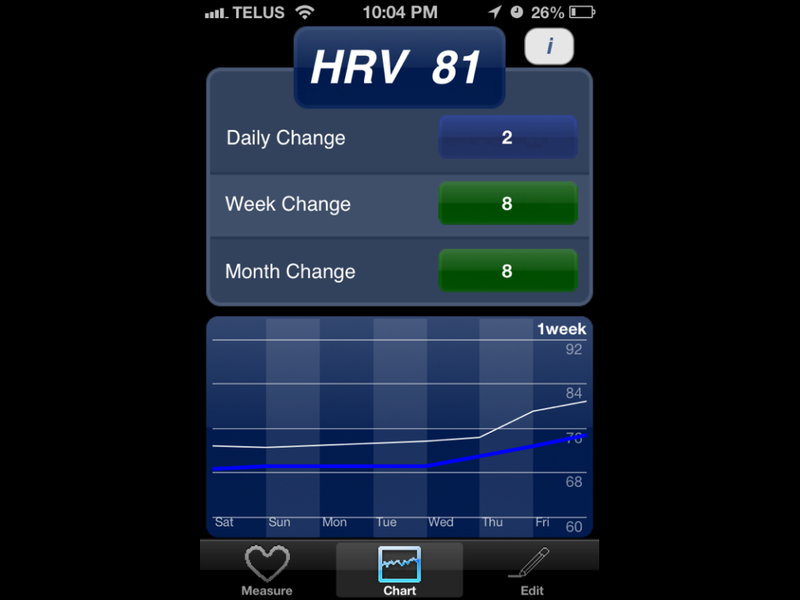 I also learned that HRV reflects illness, as well as the time it takes to fully recover from it. In the screen shot below you can see when I get sick and how long it took for my HRV to return to baseline levels (discussed in much more depth here). Based on the sRPE levels, you can see that moderate workouts were causing large drops in HRV; a clear indication that my body was still fighting the infection even though I was symptom free. I was able to adjust my training accordingly and not push it too hard until my body was ready to handle it. See also a case study by Botek et al (2012) who used HRV to guide an elite athlete back to competition after having infectious mononucleosis. HRV has also been shown to reflect acclimatization to heat (Dranitsin, 2008; Epstein et al. 2010). 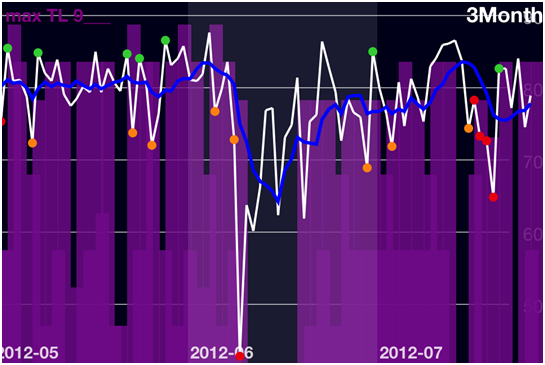 About 8 weeks ago I posted the HRV trend of a hockey player that I’m working with. Below in his screen shot you can see that the first two weeks of workouts were very taxing. However, we only had a short period of time to train and therefore waiting for optimal recovery wasn’t an option. Keeping tabs on HRV, subjective measures of fatigue and performance markers I would make small changes in his training. For example I would maintain intensity but reduce volume when his HRV was low and he felt fatigued. I’ve found volume to affect HRV much more than intensity. At this point his HRV baseline has improved 8 points and his HRV is not nearly as affected after intense training sessions. He’s put on about 10lbs of lean body mass and has increased both strength and fitness considerably; clear indications of positive adaptation. I’ve found that with this particular athlete HRV is generally in line with his perceived levels of fatigue. For example, he’ll report some soreness but that he feels great and highly motivated to train. This will typically corresponds with a good HRV score. However, on days where he reports feeling fatigued, unmotivated etc, HRV is almost always below baseline. Sleep duration and quality will also correlate with his HRV and perceived fatigue. In each of the above examples, HRV has been a valuable tool in reflecting adaptation. Acute changes (daily change) in HRV are valuable in that they reflect a transient response to a significant stressor (response to a workout, high emotional stress, awful sleep, extreme deviation in nutrition, etc.). Monitoring the weekly and monthly trends provides insight as to how training and global stress is being tolerated over time (cycle to cycle). At no point did this athletes strength performance drop during our training. Even on days with low HRV he was able to hit or match a PR in strength exercises. However, strength levels weren’t too high to begin with so I wouldn’t read too much into that. I’ve had some compliance issues with this athlete and taking daily measurements so getting him to fill in the comments section or use the training load function was out of the question. Therefore that data is not posted. In closing, taken with subjective measures of fatigue, performance and global stress, HRV can potentially reveal meaningful information about adaptation and training response. This entry was posted in Heart Rate Variability and tagged adaptation, heart rate variability, hockey, HRV, monitoring. Bookmark the permalink.